What’s your reading goal for 2014? If it’s to read more books, then this is the reading challenge for you! There have been 500+ readers who have wanted to outdo themselves so far. Are you up for the challenge? The goal is to outdo yourself by reading more books in 2014 than you did in 2013. See the different levels below and pick the one that works best for you. You can move up a level as often as you’d like but no moving down. 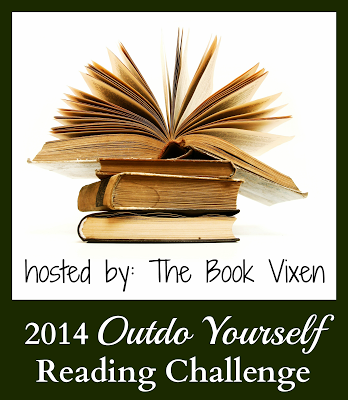 To join the challenge, grab the 2014 Outdo Yourself Reading Challenge button and post this reading challenge on your blog to track your progress. Please include a link back to this sign-up post so others can join the reading challenge too. You do not have to be a book blogger to participate; you can track your progress on Goodreads, LibraryThing, BookLikes, Libib, etc., so as long as you have a dedicated shelf for the 2014 Outdo Yourself Reading Challenge and your profile is not private. The point of linking up is to have a place where people can see what you’re reading. If I do it, I do it. If I don't do it, then I don't. NO PRESSURE! Now you ALL KNOW WHERE TO FIND THESE BOOKS, RIGHT? Look up above at the TAB called 2014 READING CHALLENGES! ALL of my Reading Challenges are under that tab! Check THERE! Thanks! Thanks for stopping by my blog! Sorry to say I haven't been keeping up writing my books down here in the Challenges section on my blog. I must remedy this! It was GREAT to see you come by for a visit, and I hope the next visit you see I'm all caught up!